On Sunday afternoon, while hubby was doing the household chores, I decided to make myself busy in the kitchen. I decided to make crepes for my angels. 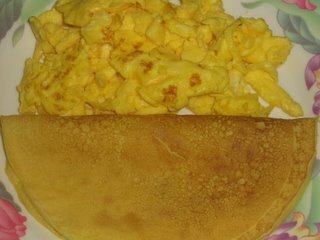 Since they wanted to eat eggs for lunch, I served them crepes and scrambled eggs .. more so like brunch eh. One thing about crepes is that they are pretty versatile. 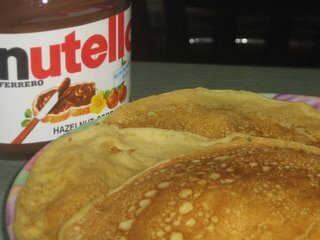 While my angels ate them with eggs, I had them with nutella. I basically just spread some nutella on the crepes and rolled them up. That was a really light and yummy treat for me!